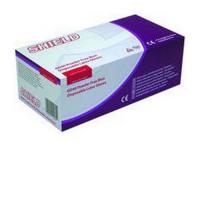 Shield Blue Powder-Free Latex Gloves Medium Pack 100 - Norwich Office Supplies - Office Stationery and Furniture for Norfolk with Delivery to all of the UK. Get all your Computer Supplies, Print Consumables, Presentation Equipment, Paper, Desking & Seating Right Here! Shield powder-free latex gloves. Blue mediuml pack of 100.